Sugoi's Men's RS Pro Bib Shorts deliver the benefits of compressive fabrics and the unparalleled comfort of Sugoi's Formula FX chamois. The outer legs utilize Sugoi's Ultra Aero fabric that's dimpled for a slippery aerodynamic surface. Slimmed-down front panels leverage highly breathable fabric for enhanced ventilation and temperature regulation so you'll be both fast and cool when the temperatures creep skyward. Designed to eliminate chafing and bulk, the integrated Formula FX Chamois is molded and welded for an excellent fit without an inseamâ€”meaning there's no seam rubbing against the saddle. 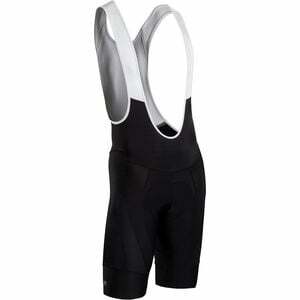 This high-level chamois features breathable perforations and a V-notch for extra ventilation on hot summer rides. Its four-way stretch fabric and advanced lamination provide a smooth surface that conforms to the body, while the welded center channel and high-density vibration dampening relieve pressure and fatigue from long, grueling rides.